Two things I love combined together to make something really great and tasty-Mexican food and soup. It is souper easy, tastes souper and it is vegan! It has lots of healthy vegetables and plenty of flavor, my husband ate 3 bowls of it, that says it all. Heat oil over medium heat in a large soup pot. Add diced bell peppers, red onion, jalapeño and a bit of salt. Cook for 5 minutes stirring occasionally. Add minced garlic and spices-cumin, oregano and cayenne pepper. Stir and cook for another minute. Add diced tomatoes, green chilies and vegetable broth. Turn heat to high and bring to a boil. Lower heat, cover and simmer for 10 minutes. Add beans, corn and zucchini. Cover and cook for about 10 minutes until zucchini is tender. Add more salt to taste if needed (mine did). Soup is ready to eat! Ole! *Recipe courtesy of Show Me the Yummy blog. **Obviously adding sour cream or cheese makes this dish non-vegan. 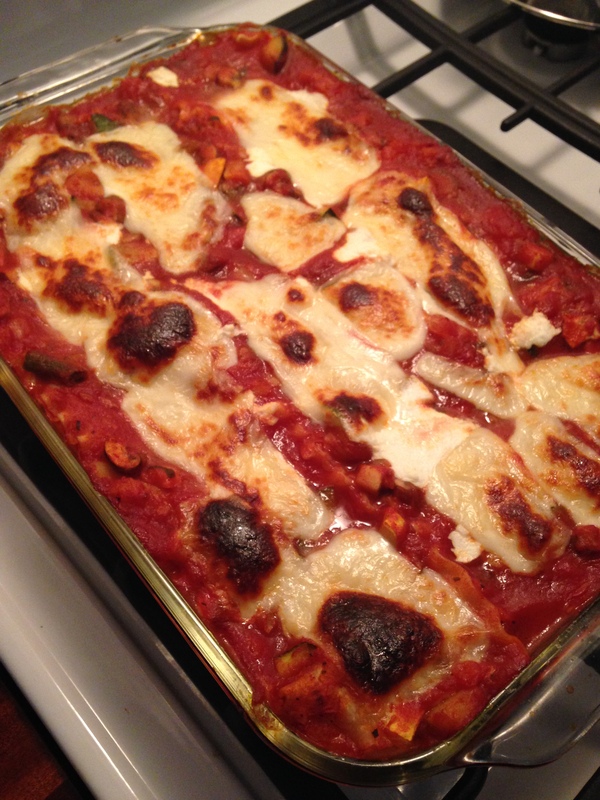 Lasagna is comfort food which usually means winter, it is cheesy, hot and gooey. Well, this is my vegetable lasagna made from lots of summer veggies, because sometimes you need that ooey, gooey, comfort food in the summer. And I know most vegetable lasagna is made with a white sauce but I make mine just like the traditional with a red sauce and it is delicious! 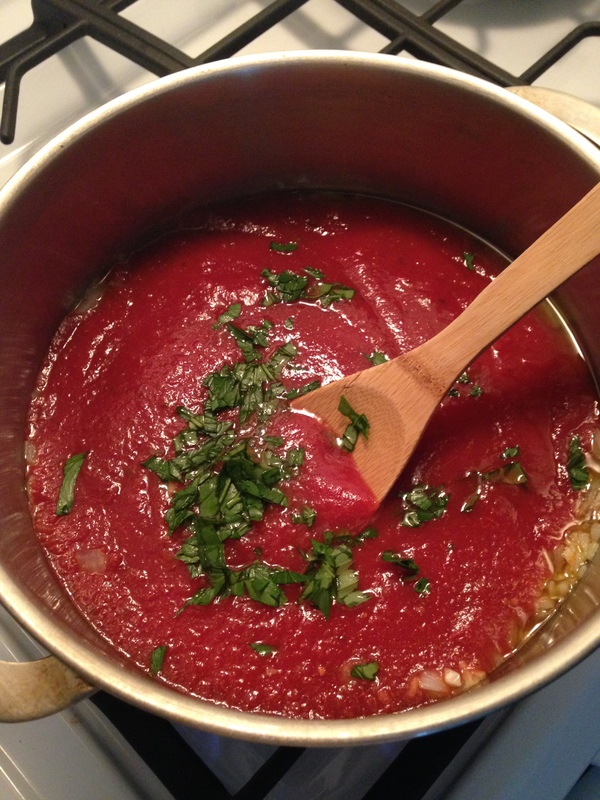 Homemade sauce with fresh from the garden herbs! In a large sauce pan over medium heat add olive oil and chopped onions, cook until soft and translucent. Add garlic and cook for about 1 minute until fragrant. Add crushed tomatoes, tomato sauce, parsley, basil, salt and pepper, stir until combined. Bring to a boil and turn down to a low simmer and cook for another 30 minutes. While the sauce cooks you can get the vegetables ready and cook the lasagna noodles. Bring large pot of water to a boil, add about 1 Tbs olive oil and add noodles, cook according to package directions, you will want them to be al dente. Drain and rinse with cold water. *You can also add some red or green peppers if you like that flavor. 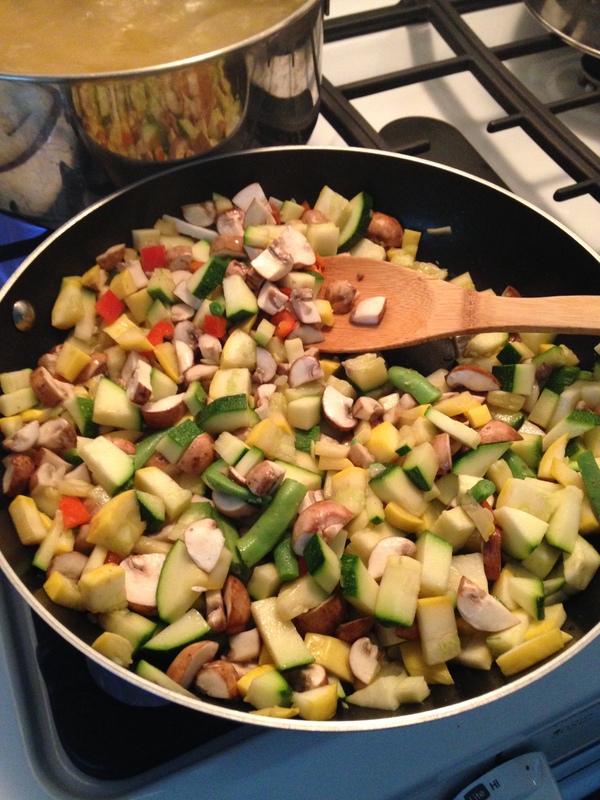 Heat olive oil in large saute pan, add zucchini, yellow squash and cook for about 4 minutes then add mushrooms. Cook vegetables till soft and tender. The vegetables will release quite a bit of liquid, drain this so that the lasagna isn’t too watery. When the vegetables are cooked and drained add them to the sauce. In a 9″ x 13″ pan cover the bottom of the pan in thin layer of sauce, place 3 noodles length wise in the pan and cover with the vegetable sauce, add a layer of baby spinach, spoon ricotta cheese over the spinach and then the mozzarella cheese, repeat. You will have 3 layers of noodles with the top being the mozzarella cheese. Cover with tin foil and place in oven at 350 degrees for 30 minutes. Remove foil and bake for another 15 minutes or until slightly browned. Let it sit for 15 minutes before serving. Serve with a salad and some crusty bread…you’re all set. Enjoy! Finished product…I left it in the oven just a tad too long. I love pasta. I love artichokes and asparagus. If you love all of those things then you will love this dish! It is great summertime dish that is quick and easy. The freshness of the lemon and crisp summer vegetables are just delicious in the light cream sauce. Put olive oil in large saute pan over medium heat. Add asparagus and lemon juice, cook for about 5 minutes and then add artichoke hearts. Cook together for about another 4 minutes. Remove the vegetables to a bowl and set aside. Add butter to pan and melt, add garlic to melted butter. Saute until garlic is fragrant. Add flour and stir, the mixture will thicken. Slowly add milk and keep stirring until the mixture becomes smooth. Add drained pasta and stir to coat. Stir in vegetables and season with salt and pepper to taste. 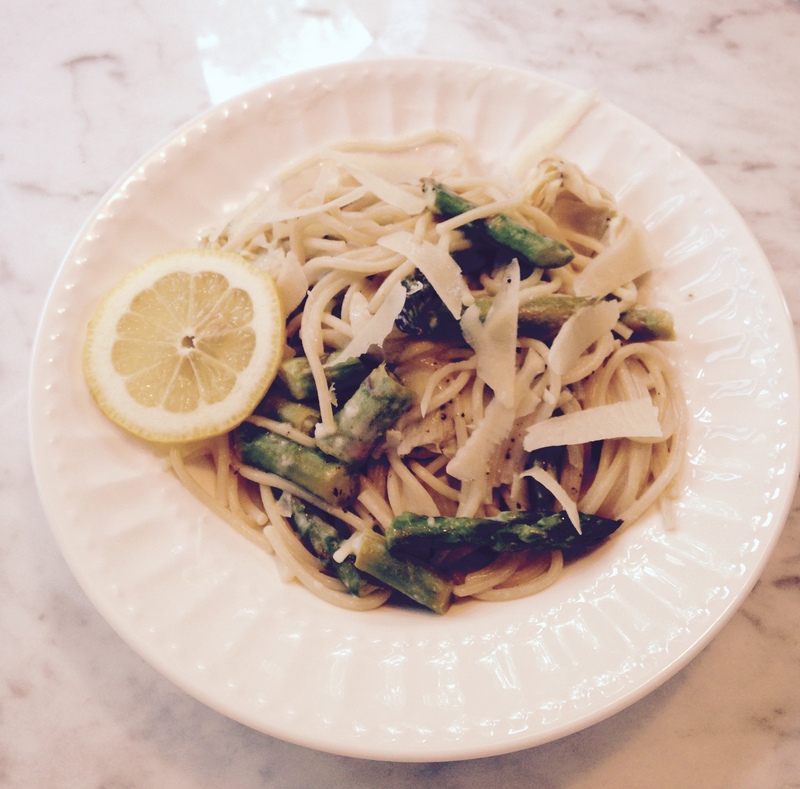 Serve with grated parmesan cheese, lemon slice and enjoy! So, I sit here writing this on the first day of Spring and it is snowing out. When will it end? Hopefully soon but until it does, let’s eat soup. This recipe is a copy cat recipe of Olive Garden’s famous Pasta e Fagioli, meaning “pasta and beans”, it is traditionally a meatless Italian dish however this recipe adds ground beef but I stuck with tradition and left the meat out, which makes this a great meal for meatless Mondays. This is easy, healthy and makes a great meal, definitely give a whirl! 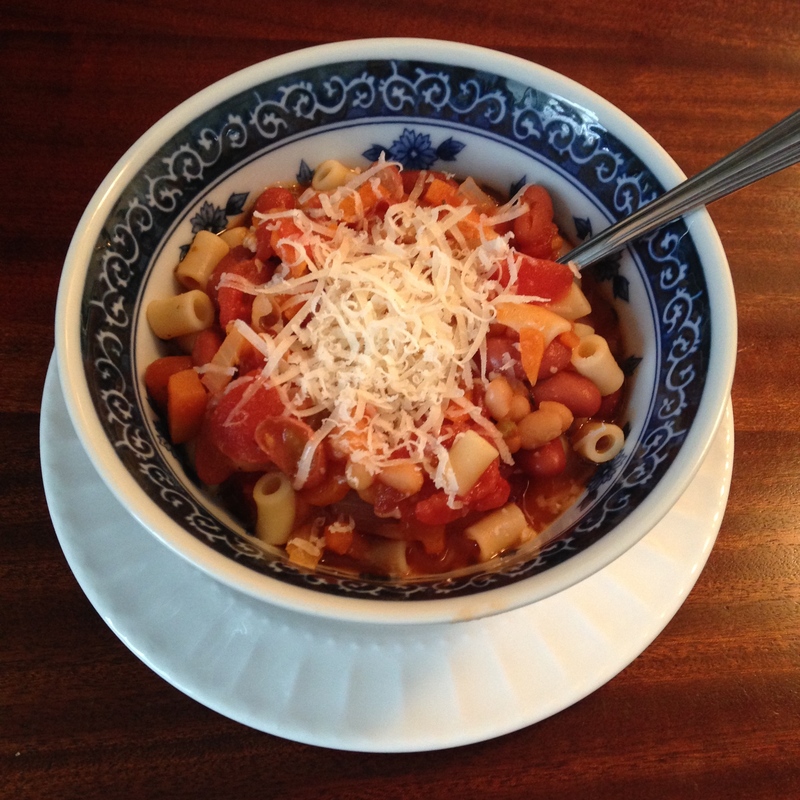 Pasta e Fagioli with shaved parmesan cheese-buon appetito! Heat olive oil large dutch oven or pot, add carrots, celery, onion and sauté for about 10 minutes then add minced garlic. Saute for a few more minutes until garlic becomes fragrant. Add remaining ingredients, except the pasta and simmer for 1 hour. You may want to add more broth at this point depending on how you like it. About 15 minutes before the hour is up, boil water for pasta and cook pasta for 10 minutes or until pasta is al dente. Now, a tip from a friend is: to not add the pasta to the soup…add it as you eat it so that it doesn’t blow up in the soup and absorb all the liquid. This was great advice. I kept mine in storage container and added as we ate it. Serve with shaved parmesan cheese and warm, crusty bread; delicious! *If you would like to do the meat version the first thing you do is cook the ground beef until browned, drain the grease. Set browned ground beef aside and cook veggies as above in same pot, when veggies are ready, add ground beef back into pot and follow the recipe from there. Enjoy!